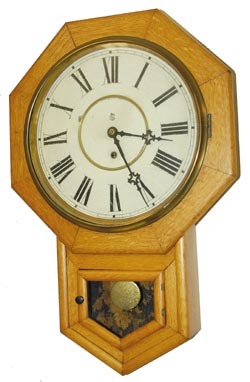 Waterbury Clock Co. "Drop octagon, 12 Inch", C. 1891. Light oak case is 24" tall, some joints have been reglued; bottom and top door hinges have some play, bottom glass is now glued in place, and top is probably replaced also. I suspect the clock fell as the wall hanger appears to have some repairs and the base of the case, although looks OK, has a chip on the back and some glue in the lower case joints. 8 day movement, time only, hands and metal dial are original. The label inside is in tatters. Nothing bad wrong with this clock, but it needs some attention to get it back where it needs to be. Ly-Waterbury #670.